Francis, moreover, launched a broadside against former President Ronald Reagan’s signature economic theory, which continues to serve as conservative Republican dogma. Of course, he’s in the Vatican, so he’s insulated from the US political issue. But I’m always re-examining what “separation of church and state” means. (And so is Dustbury.) I will make the case that being a good Christian – in my definition, obviously – could be, may be perceived as a political statement. If a Catholic priest were to echo Francis’ complaint about the rich-poor divide, perhaps by calling for raising the minimum wage, that might be safe territory. But if he were to name names, such as calling out the late 40th US President, that might well be crossing the line to partisan political talk that could theoretically get one’s tax-exempt status yanked. Certainly promoting, or denouncing a political party or candidate can be a treacherous path, whereas, say, praying for the President and Congress and the federal courts to do good and just actions is OK. Calling for the closing of the wage-productivity gap is OK, but calling out the politicians who created the system, not so much. It was weird watching Peggy Noonan on ABC News’ This Week with George Stephanopolis this past Sunday. She was SO pleased by the new pope, who was bringing back some of the disaffected Catholics, even though he was directly dissing her former employer and mentor, Ronald Reagan, who she clearly adores (present tense). It’s enough to give other denominations a case of pope envy. Francis still stubbornly traditional positions on women’s ordination and other issues notwithstanding, I’m liking this Pope; the fact that his position is considered radical by some tells how far from Christ’s teaching some of the church has become. No, the US is NOT closing the Vatican embassy. It’s interesting watching conservative/libertarian responses to Francis, after years of seeing conservatives bash liberal Catholics over the head with “You don’t get to pick and choose what to believe if you really want to be Catholic.” Onto the scene steps a Pope with whom they have some disagreement, and all that authoritarianism goes out the window. 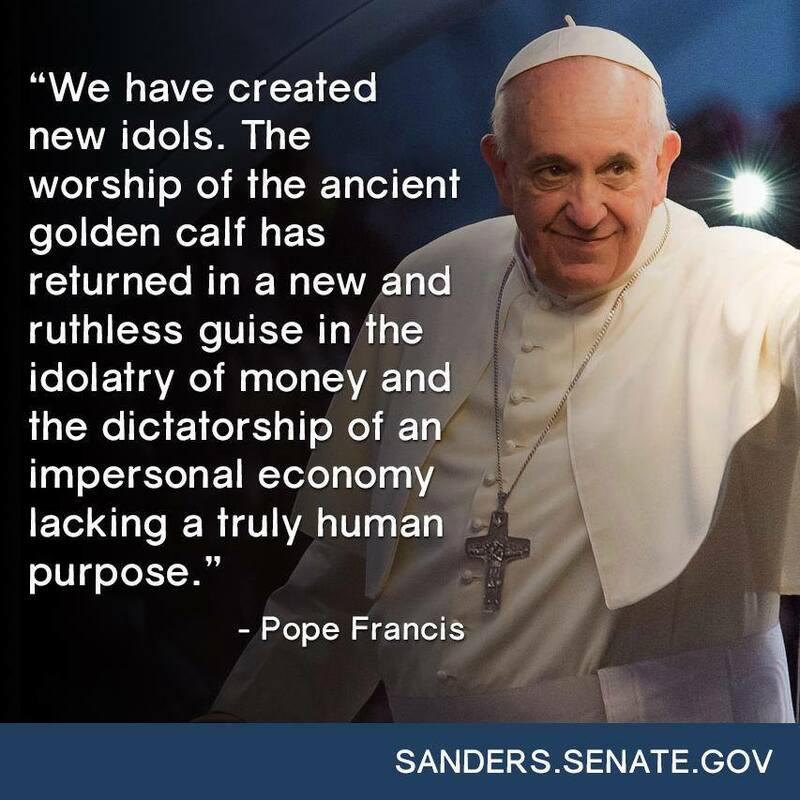 I’m not Catholic and never will be, and I’m sure there are lots of things I wouldn’t agree with Pope Francis about. But I’m thrilled that someone in so august a position is speaking against economic inequality. That needle has to start swinging back the other way eventually, and I’d like to live to see it (having been all of nine years old when Reagan took the oath of office and ushered in the Era of Funneling Money Upwards).